It does not include expert opinion. It contains links to primary articles and an area devoted to new information that changes current practice. The clinical relevance of these materials comes from their initial focus as academic detailing tools for the front line practitioner wanting to provide the best possible drug therapy for their patients. If an article you want is not in the SHIRP collection, we can get it for you free of charge from another library. 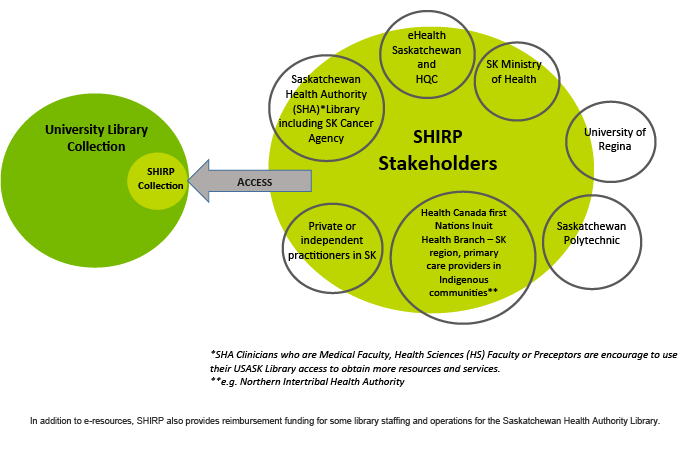 SHIRP is a program of the University Library that licenses a sub-set of the University Library's health sciences e-resources for access by Saskatchewan's licensed health care practitioners, post-secondary institution students and employees, and employees of the Ministry of Health and designated health related organizations. This guide compiles resources on the topic of LGBTQ2+ Health and contains a broad range of information useful to provincial health-care practitioners. Access to SHIRP resources is free for any licensed health care practitioner in Saskatchewan. Offsite access to the SHIRP website is available by requesting a SHIRP User account. License or registration number from a licensing body in the province of Saskatchewan is required. Approval is usually granted within 24 hours.